For sleep, I use Sleeps as Android to keep track. When I put down my phone at night, I hit a button to stay I’m going to sleep and then when I wake up, I hit another button to say I’m not sleeping anymore. The caveat of this is that I rarely ever fall asleep right away. Sometimes it takes me ten minutes and other times it might take me an hour. So the accuracy of my sleep isn’t the best. I have horrible sleep. It’s really hard for me to get 8 hours of sleep everyday. I tend to go to bed late and wake up early because I’m a morning person. It’s tough trying to sleep earlier especially when sometimes social life can get in the way of that. 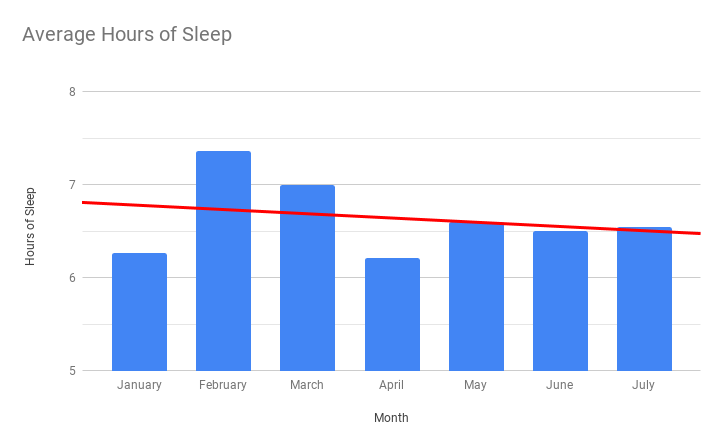 I can’t believe I was getting average seven hours of sleep back in February and March! For time on my phone, I use App Usage. This is fairly accurate from what I can tell. I have checked it a few times and it is really ruthless. There’s no cheating this app! It just keeps getting worse and worse. 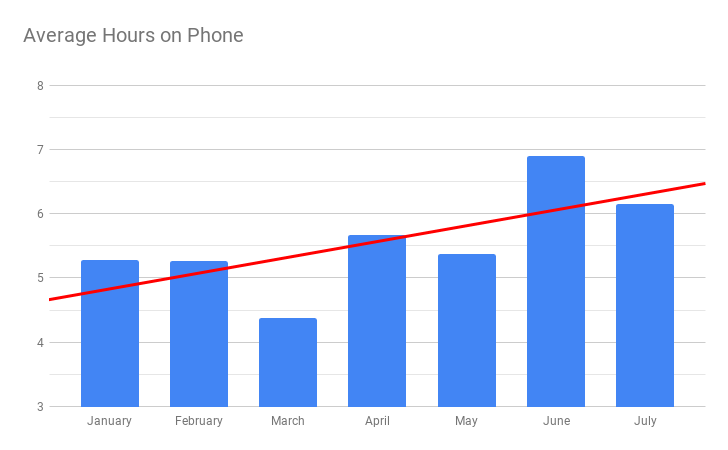 I spent a lot of time on my phone in June and I can’t for the life of me figure out why. At least I curbed my usage a bit in July. I installed Forest on my phone and it’s been pretty good for me getting off my phone! For the number of steps, I previously used the Moves app which is now closed down by Facebook. Currently, I use Samsung Health. It seems to be fairly accurate. I’m getting a lot more steps with it, however. Now I’m thinking Moves was simply inaccurate. I am just loving that spike in May. 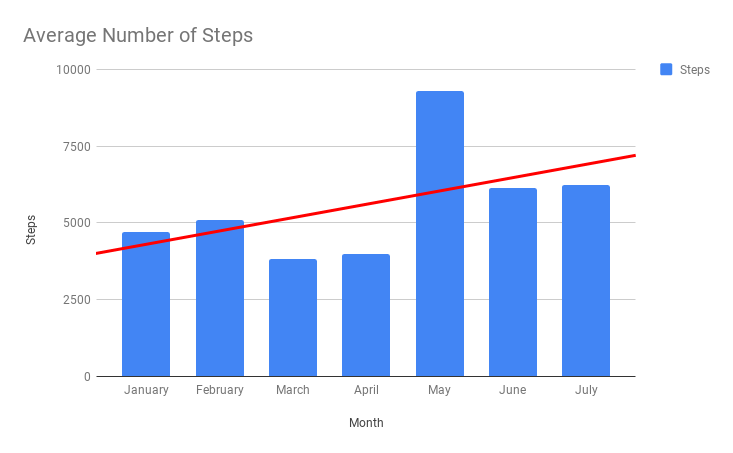 I took a trip to New York City in May and it involved a lot of walking! Like a true New Yorker, we took the subway everywhere and wore off the soles of our feet. It was a super fun way to explore NYC! My social life also sky rocketed in May. It seemed like almost every day I was hanging out with people. Since I don’t drive, I walk and take the train everywhere. In June and July I tried my best to talk at least everyday. I would walk over to the nearest library and use the computers there to learn something new or apply to jobs. Of course, I would also browse the stacks for any books that I wanted to read! The only stats that I’m happy with is my walking. I think an average of 6,000 steps is a pretty good number. They say the recommended is 10,000 steps per day and I am in awe of people who can accomplish that! This August I’ve been trying my darndest to sleep earlier and to spend less time on my phone. Since I’m going to be starting work (hopefully) soon, I’m trying to get back into my more productive habits. Keep aiming for daily walks!